Cardamom, a native of every green forest is a commonly used Indian spice. There are many health benefits of this wonderful spice, such as digestion, helps to heal dental pains, fights depression etc. Cardamom is a spice that is added in almost every Indian dish as it adds great aroma and taste to food. 1. Separate the egg whites and egg yolks and keep them separately. 2. Beat egg white till stiff. 3. Sift flour, baking powder and green cardamom seeds together and keep aside. 4. Beat sugar and oil together in a pan for few minutes. 5. Add egg yolk and mix well. 6. Add flour and curd in the mixture and beat well. 7. Grease the container and pour the batter into the container. 8. Sprinkle sugar and cashewnuts on the batter and microwave it for a maximum of 4 minutes. 9. After 4 minutes if still sticky, you may keep it for another 30 seconds or a maximum of one minute. 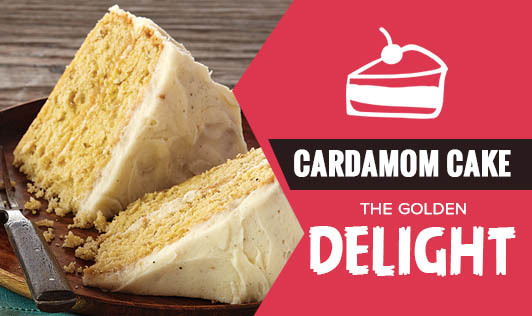 Enjoy this cardamom delight with ice cream for a dinner party or a good evening snack for your child. You can send us your cake recipe to get a recipe makeover. Go to "tools --> recipe makeover"